Welcome to Southern Maine Coffee News®! We are sure you have seen this “good news” publication all over the Southern Maine. Eager readers in our local communities are well served by our fun, weekly publication. 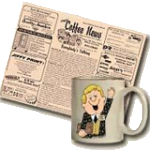 Fresh weekly issues of Southern Maine Coffee News®, can be found in locations throughout the local community. You will enjoy this free, fun, weekly publication in local restaurants, coffee shops, hair salons, professional offices, community buildings and other local businesses where people have a few minutes to read good news and fun features while waiting. Our goal is to be “everywhere” within the community to maximize enjoyment for our readers and exposure for our local advertisers.